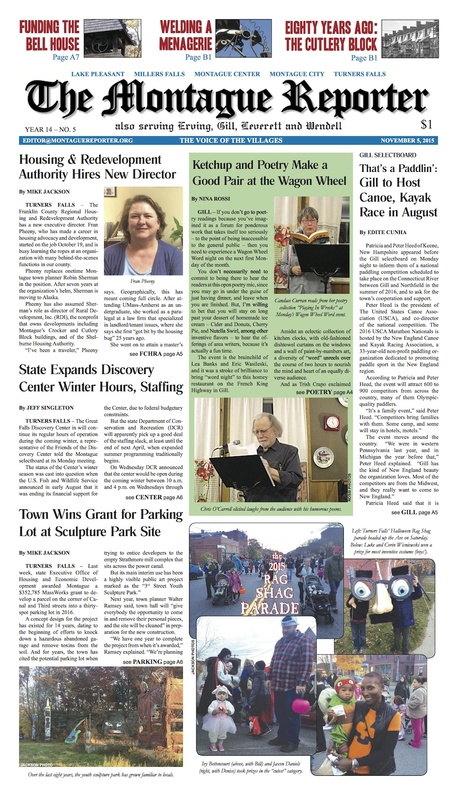 Montague receives a grant to pave the sculpture park and put up a parking lot. The Discovery Center receives support to expand winter hours and staffing. The Franklin County Regional Housing and Redevelopment Authority gets a new director. Gill prepares to host many canoers this August. Poetry comes to the Wagon Wheel. The Rag Shag Parade brings kids in cute costumes to Avenue A. GMRSD upgrades computer systems. Montague’s selectboard approves a bell funds request, pole locations, and a pipeline liaison, while Wendell’s special town meeting approves all of its articles. Erving abhors its leaf vacuum. And not one, but two editorials offer guidance on managing fallen leaves (without a vacuum) and seeing cool stuff in the sky. MoRe: A look back at growing up in the Cutlery Block. A Gill artist welds memories into a metal menagerie. TFHS football trounces Cathedral, while the volleyball team bests Greenfield. The Gardener’s Companion admires the clarity of light. In the Montague Police Log: hunters gonna hunt; haters gonna hate; a theater group and Shea board end up in a shoving match; and women behave badly. 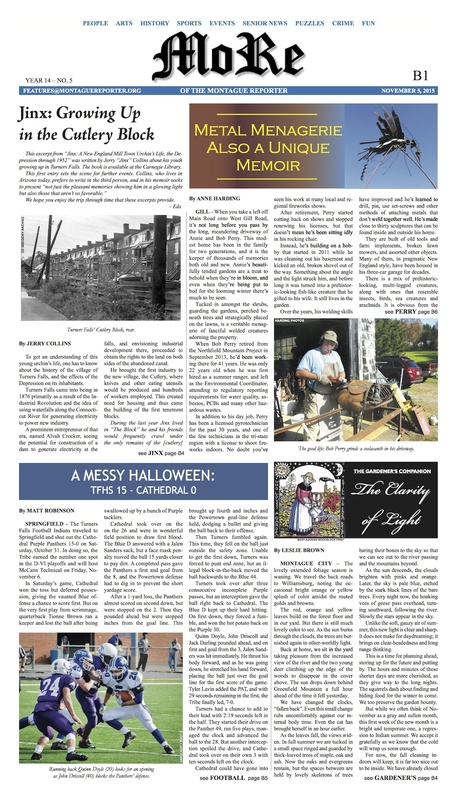 Plus: Weird Healing, Pet of the Week, the Healthy Geezer, arts, events, and MCTV listings, and more. On newsstands now!